Lady Gaga is one of the top Pop Culture icons of this decade, and rightfully so with all the hard work and dedication she puts into not only her music but her image. 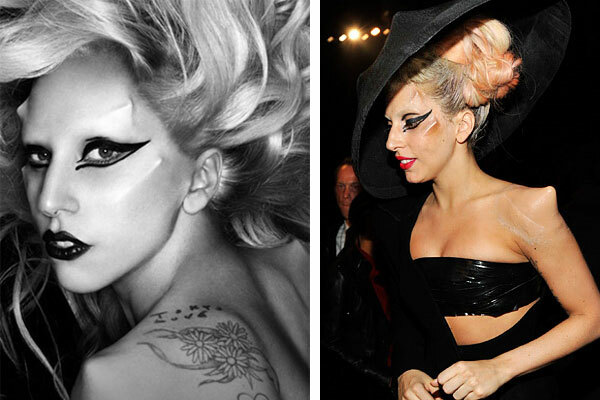 Lady Gaga has furthered this character she’s created with funky hairstyles, makeup, costumes and even tattoos. To put her own personal spin on the tattoo thing Lady Gaga has made a deal with her father that she will only tattoo the left side of her body to keep her “half ordinary”. “It was actually per my father’s request,” she said. “He asked that I remain, on one side, slightly normal.” She referred to her left side of her body like her ‘Iggy Pop side’ and her right side (without tattoos) her ‘Marylin Monroe side’. It is rumored that Lady Gaga got her first tattoo at age 17 when she got a hold of a fake ID. The Tattoo is of a treble clef and is located on the middle of her lower back. 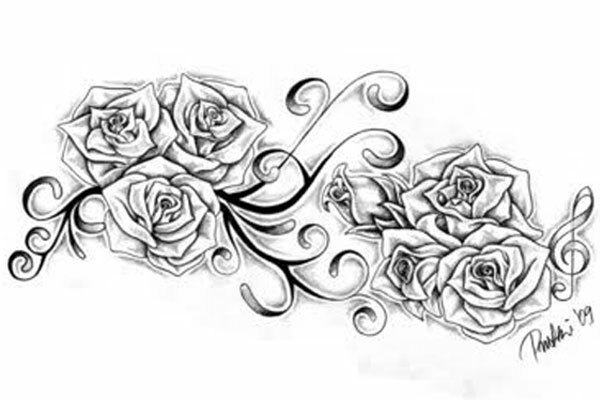 The tatt next to the treble clef is a mass of swirling roses that was inked by famous tattoo artist Kat Von D.
Lady Gaga’s left shoulder currently has three separate tattoos, a cluster of three daisies, Tokyo Love with a heart, and a DAD tattoo encircled with a heart. The first of the three was the daisies, and because she has never publicly spoken out on why exactly she choose them we can only assume that she loves flowers. Her next shoulder tatt was the Tokyo Love tattoo which can be considered much more risque! On the inside on Lady Gaga’s left wrist she sports an upside down peace sign, although she says when she looks at it it is the right way. The peace sign tattoo is a tribute to John Lennon of the Beatles, whom she considers a “hero”. versagt würde zu schreiben. Muss ich schreiben? 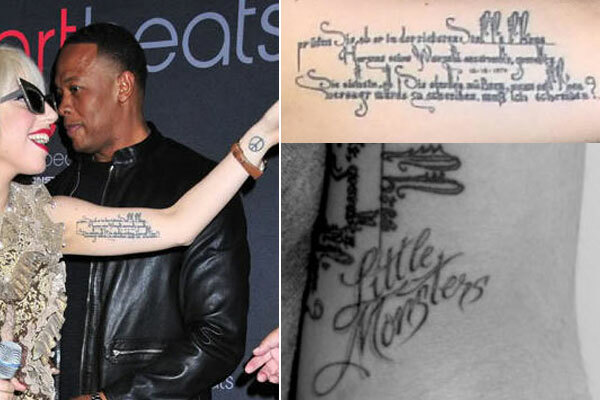 In 2010 Gaga inked “Little Monsters” next to her Rilke tattoo as a tribute to her fans. The tattoo on Gaga’s upper left thigh, which was done by Bad News Becca on September 6, 2010, is an image of a unicorn with the words “Born This Way” wrapped around the horn. The tattoo is a commemoration of her third album, Born This Way. Lady Gaga has recently been rocking another new look lately in the form of a type of body modification. She first donned the look at the 2011 Grammy Awards and has since been sporting them at every opportunity available, March Vogue cover-shoot aside. The prosthetics are located on her forehead, cheekbones, and shoulders and give her a rather evil and demonic vibe. 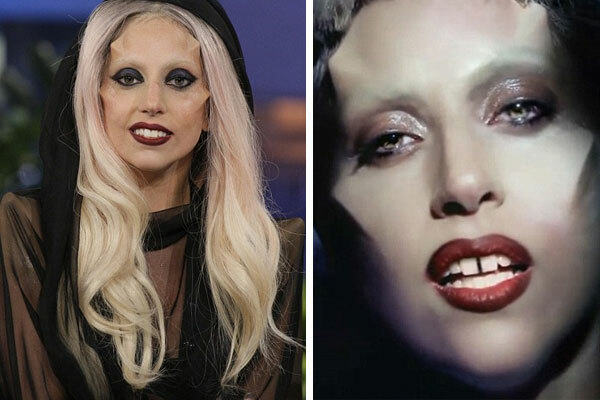 OH Reeealy Lady Gaga, NO plastic surgery you say…We beg to differ! 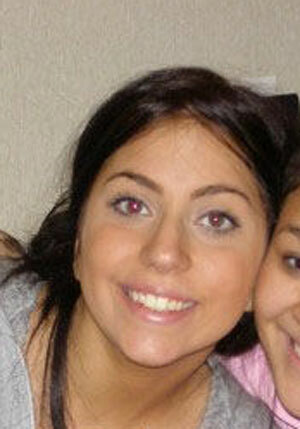 Check out our post on Lady Gaga Nose Job HERE. What do you think, does she look hot with the new front teeth gap, and body modification or contrived? Lady Gaga has become the queen of costume changes. She changes her look from morning to night and you never know what she will come up with next. Have you ever wondered what she looked like before the fame monster took hold, back before the plastic surgery, crazy costumes, and boatloads of makeup? Well, you ask, and we shall answer!